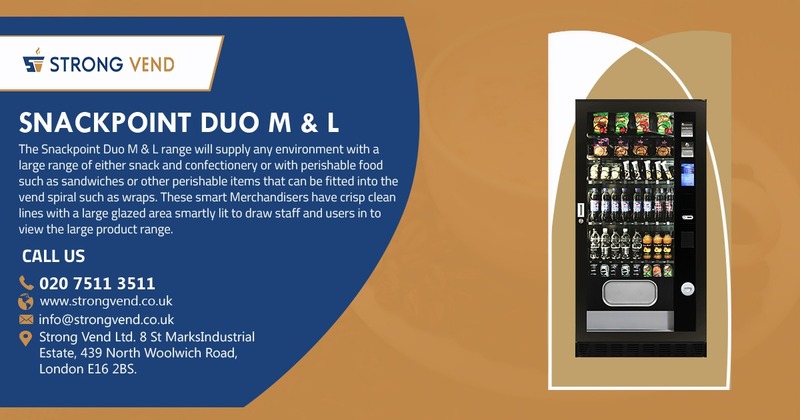 The Snackpoint Duo M offers 40 selections of confectionery and snacks which gives a choice of 8 bagged snacks and crisps and 8 chocolate and confectionery items plus 24 cans and bottles. The larger Snackpoint Duo L offers 50 selections of confectionery and snacks which gives a choice of 10 bagged snacks and crisps and 10 chocolate and confectionery items plus 30 cans and bottles. These machines are fitted with the most effective chiller systems which enables perishable food to be offered, if required, on the bottom three shelves of these machines. It is fitted with a health timer which ensures that the correct temperature is held for sandwiches and any other perishable items that are required.